Gratin is a widespread culinary technique in food preparation in which an ingredient is topped with a browned crust, often using breadcrumbs, grated cheese, egg and/or butter. Gratin originated in French cuisine and is usually prepared in a shallow dish of some kind. A gratin is baked or cooked under an overhead grill or broiler to form a golden crust on top and is traditionally served in its baking dish. A gratin dish refers to the shallow oven-proof container traditionally used to prepare gratins and similar dishes. The etymology of gratin is from the French language in which the word gratter meaning "to scrape" or "to grate" as of the "scrapings" of bread or cheese, and gratiné, from the transitive verb form of the word for crust or skin. The technique predates the current name which did not appear in English until 1846. In addition to the well-known potato dishes such as Gratin Dauphinoise, cooking Au gratin is a widely used cooking technique in the preparation of numerous dishes including many meat, fish, vegetable and pasta dishes, fennel, leeks, crabmeat, celeriac and aubergines (eggplant). The term le gratin signifies the "upper crust" of Parisian society, and, as gratin, has since been borrowed into English. A broiler pan is a pan specially designed to use in the oven for broiling. A broiler pan comes in two pieces, a slotted upper pan and a deeper, solid lower pan called a drip pan. Broiling allows food, such as meats, to be cooked at extremely high temperatures with a direct heat typically coming from above rather than below. The broil setting on an electric oven allows the heat to come from the heating element at the top of the oven while turning off the bottom heating element. Gas ovens often have a separate lower drawer for broiling that allows food to be inserted below the pilot flame. Broiling is a popular way to prepare meats, poultry, seafood, and vegetables. Unlike frying, the food is prepared without oil and is thus considered a healthier way to cook. The design of a broiler pan allows the natural fat and grease from meats to drip off through the slots of the upper pan into the lower pan. Cuts of meat, poultry or seafood should be thin and if lean, should be marinated or glazed to retain moisture since the broiling is a quick, but direct source of intense heat and can dry meat. A casserole dish is a piece of bakeware designed for use in making casseroles, baked dishes which combine a number of ingredients and a thick sauce. Many nations have variations of the classic casserole, ranging from Italian lasagna to American macaroni and cheese. 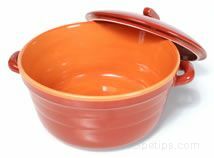 The casserole dish has several unique properties which make it well suited to these baking projects. Most kitchen supply stores sell casserole dishes in a number of shapes, sizes, and materials. Any piece of bakeware is designed to withstand long cooking. A casserole dish is also capable of keeping food from burning or drying out, and it promotes the formation of a crispy crust which seals in the flavor of the food. This is accomplished by making a casserole dish thick, and often by coating it with a layer of enamel or glaze. Plain glass is a common material for casserole dishes, but they are also made from thick enameled metal, such as Le Creuset, and glazed earthen or stoneware. In many cases, a casserole is served directly from the dish it is cooked in. Because of this, a casserole dish may be made slightly ornamental, so that it looks attractive on the table. The dish also typically has large handles which make it easy to grip with the assistance of a potholder. In many cases, a mating lid may be designed as well, for transporting casseroles safely and for keeping them from drying out while under refrigeration. If the plan is to roast chestnuts, then the best results will be achieved by using a chestnut pan. With a special design that helps to ensure an even temperature during the roasting process, the chestnut roasting pan is a little different from the average roaster or frying pan. Here are some of the unique attributes of the chestnut pan, and why it works so well for the preparation of chestnuts. At first glance, the chestnut pan looks a lot like any larger skillet or frying pan. The big difference is found in the bottom of the pan. A series of holes in the bottom of the chestnut pan allow for greater direct exposure for the chestnuts. The result is that the chestnuts cook more evenly and there is less chance of the batch containing some nuts that are overcooked while others are undercooked. Another unique feature of the chestnut pan is a longer handle than most household frying pans. Roasting chestnuts is an activity that can take place over an open fire as well as on a stovetop. The longer handle makes the task of jiggling the pan and moving around the chestnuts much easier. Most handles on chestnut pans are constructed of wood or coated with some sort of insulation that keeps it cool to the touch.